Women made their Olympic debut at the Paris Games in 1900, although only 19 of the 1,225 athletes were female. British tennis player Charlotte Cooper became the first female Olympic champion, beating Hélène Prévost of France 6-1 6-4 in the final of the singles. American Alvin Kraenzlein, whose father was Austrian, became the first athlete to win four golds, taking the 60metres in a world record 7.0 seconds, the 110m hurdles in a world record 15.4secs, the 200m hurdles (25.4secs) and long jump (7.18m). But the decision to hold the Olympics during the Universal Exposition backfired. The Games were overshadowed, went almost unnoticed and were referred to as the Paris Championships or Great Exhibition meeting. 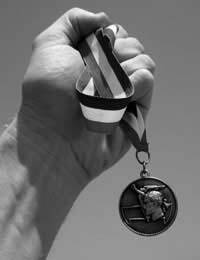 Many winners were unaware they were Olympic champions until years later. Only handfuls of spectators attended and controversy over Sunday competition further blighted the Games. For the first time, gold, silver and bronze medals were awarded to the top three contestants in each discipline at the Saint Louis Olympic Games in 1904. The long, costly journey prevented many European nations participating. Only 12 nations were represented, but marathon runners Len Tau and Jan Mashiani of the Tswana tribe became the first Africans to compete. Like in Paris, the Saint Louis Games were overshadowed, this time by the Louisiana Purchase Exposition, and the 1904 Games will always be tainted by a shocking addition entitled Anthropological Days, when African and Native American tribes were forced to make a humiliating exhibition of their links with sport. There was a hat-trick of wins for ‘Milwaukee Meteor’ Archie Hahn in the 60m (7.0secs), 100m (11.0secs) and 200m (21.6secs), and fellow American Ray Ewry matched the feat in the standing jumps – high jump (1.50m), long jump (world record 3.47m) and triple jump (10.54m). The 1908 Games were initially awarded to Rome, but following the eruption of Mount Vesuvius in April 1906 they were switched to London. During the opening ceremony, athletes from 22 nations filed into the 68,000-seater White City stadium country by country behind their flags, which was a first. Tickets were overpriced at what were the wettest Games in history, so attendances were generally poor. The home hero was British swimmer Henry Taylor, who won triple gold in the 400m (5mins 36.8secs), 1500m (22:48.4) and as a member of the British 4x200m team. There was controversy when Italian Dorando Pietri was disqualified and stripped of gold in the marathon after being helped over the line by officials, and when the Americans boycotted the re-run of the 400m final after John Carpenter had been disqualified for elbowing. It allowed London-born Scot Wyndham Halswelle to take gold unopposed. Electronic timing, photo finishes and a public address system were introduced for the first time at the Stockholm Games in 1912. American James Thorpe won the pentathlon and then the decathlon in a world record so far ahead of its time it would have earned him silver at the 1948 Games. Finn Hannes Kolehmainen won the 10,000m and four days later added gold in the 5,000m in a world record 14mins 36.6secs. Women’s swimming was introduced for the first time, but Sweden’s refusal to host the boxing tournament led the IOC to limit the powers of host nations. The 1916 Games, awarded to Berlin, took place in Antwerp in 1920 with Germany and the other aggressor nations from World War I – Austria, Hungary, Bulgaria and Turkey – not invited. The Russians, embroiled in a civil war, were absent too. The Olympic flag, designed by Baron Pierre de Coubertin with five rings signifying the unity of the five continents, was part of the opening ceremony for the first time, as was the Olympic oath, read by Belgian waterpolo player and fencer Victor Boin. Italian 26-year-old Nedo Nadi won five fencing golds – individual foil and sabre, and team foil, sabre and épée – while Swedish shooter Oscar Swahn won team gold in the double-shot running deer event to become the oldest medallist in Olympic history at 72. Finland had celebrated independence in 1917 after more than a century of Russian rule and, despite the destruction caused by the Great War and Russian Revolution, shone in Antwerp. Finnish athletes won 15 track and field gold medals, matching the mighty USA.